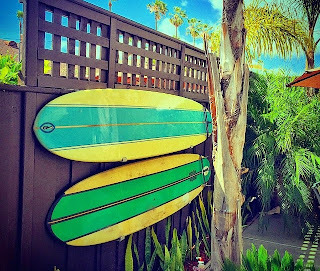 Check out some of the latest photos from our fans of their surfboard racks in action. These photos are of our Naked Surf Rack, a super minimalist surf rack that is a great way to show off your surfboard while most of the rack remains hidden. 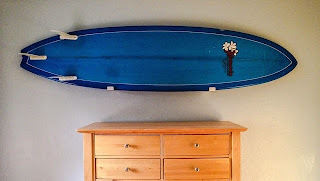 The Naked Surf rack takes the minimalist approach when it comes to storing and displaying your board. The idea behind the Naked Surf is that your board is a work of art, so the rack shouldn't distract from its beauty. We like to say that the Naked Surf is "barely there" which means it covers as little of your board as possible while still securely holding your board in place. If you're looking for a lightweight, affordable, and non-intrusive way to show off your favorite board then the Naked Surf is an excellent option. While aesthetically minimalistic, the Naked Surf does not sacrifice structural integrity. The Naked Surf rack arms are made from a single piece of Aluminum that have been custom cut and bent. Each rack arm has two pre-drilled holes that allow you to mount up to two screws in a single stud. This results in an incredibly sturdy surf rack for its size that is appropriate for shortboard or longboard use. Lining the inside of each rack arm is a thick piece of felt for a soft place to rest your board and prevent long term pressure point distortion on your board.